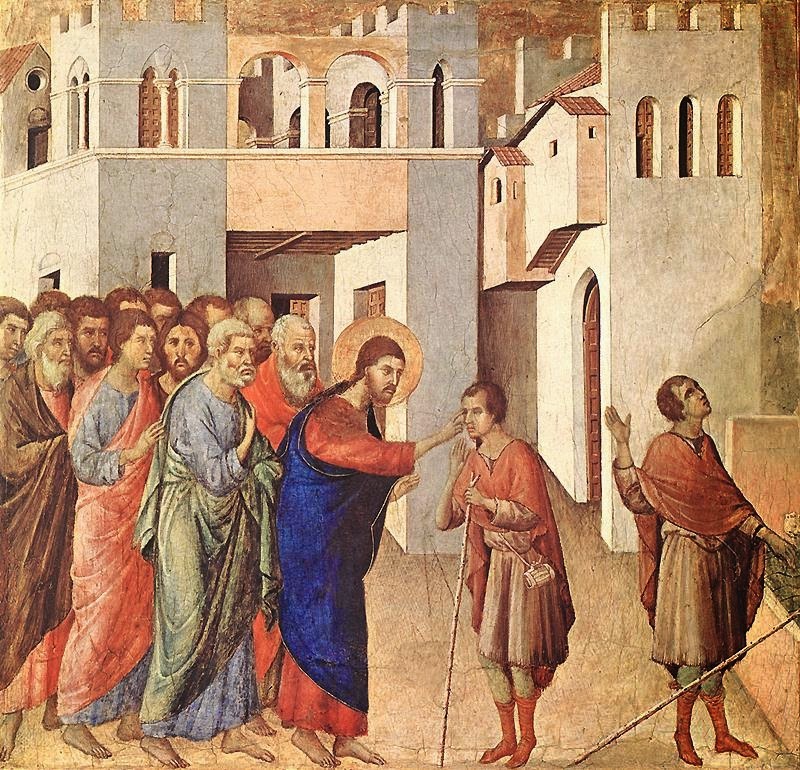 Jesus encounters two blind men in today’s Gospel Reading. Now Jesus had just previously come from a local ruler’s house where he performed two very great miracles. One was the healing of a woman whom we are told has had a terminal issue of blood for twelve years. We are not told the nature of this illness other than the fact that Christ healed her as he was on his way to attend to the ruler’s daughter, whom we are told has died. Christ comes to where the family has laid the body of the child and were mourning her. Christ put the crowd out of the room and proceeded to raise her from the dead. Now, as Christ departed from that place, he begins to be followed by two blind men. These men are crying after Christ saying, “Son of David, have mercy on us”. This is very important in that it is signifying the coming of the Messianic Age, as foretold by the Prophet Isaiah. Isaiah prophesied saying, “The eyes of the blind shall be opened and the ears of the deaf shall hear…” In the Gospel, Christ heals them both, thus proving that He is the long awaited Messiah. It is rather significant and a further proof of the great Faith that these two had when they hailed Jesus as “Son of David”. This is a term used only for one person in all of Heaven and Earth. It is a title reserved for the Christ, the Messiah. This puts into definite terms that Jesus is the Messiah, unequivocably. The witness of the two blind men is an incredible testimony of the power of Great Faith. It has been said that all of mankind’s reasoning, rationalization, and indeed, his science has a definite termination when his life ceases. In other words, all worldly knowledge has an end in physical death. It is Faith alone that can safely ferry us to the distant shore after physical death. Faith points to that which is unseen. It is not a hopeful longing of that in which we believe, but it is rather a sure expectation of what God has promised. But what are the marks of Great Faith? Firstly, Great Faith is humble. Seeks nothing of worldly acknowledgement. “The thief who received the kingdom of heaven, though not as the reward of virtue, is a true witness to the fact that salvation is ours through the grace and mercy of God. Great Faith moves mountains. It transcends the fallen-ness of this world and is the well tallowed wick that readily receives the flame of the presence and indwelling of the Holy Spirit. All miracles ever performed by God have as their beginning the willing and guileless Faith of the one for whom the miracle is performed or witnessed by. Great Faith has seen the miracle of the parting of the Red Sea, the feeding of the multitude with five loaves and two fishes, the healing of the paralytic, the bestowal of sight to the blind and indeed, the raising back to life of those whom had been handed over to death and the tomb.